LITTLE ROCK, Arkansas — There is one thread linking all humankind together: In the words of the late George Harrison, bassist for The Beatles, “all things must pass.” From funeral rituals like mummification in Ancient Egypt to pyre of the Vikings, humans throughout the centuries have put their own marks on celebrating the dead – and now avid boaters are being represented in Glory Boats, a burial casket designed to look like a watercraft. Starting at $2,800, three models are available for purchase online including Woodland Camo, Marsh Grass and Pink Camo. Each model features a steel casket with a patterned interior fabric and a canvas top that appears to be held down with bungee cords for an authentic boat look. The idea came to Joel Schmidt, the owner and creator of Glory Boats, after his 75-year-old father had an accident and the difficult conversation came up of what kind of funeral preparations should be made in the incident Schmidt’s father died. 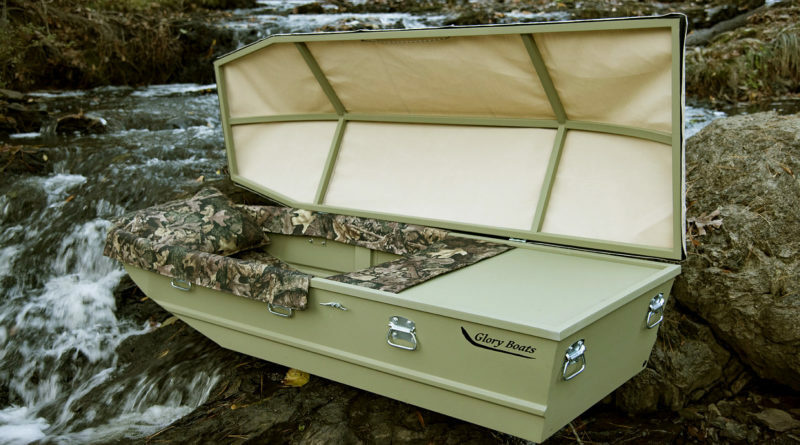 A hot commodity since it was launched in August, Schmidt said he has received many inquiries about Glory Boats with funeral homes in Arkansas and Tennessee. To learn more about Glory Boats, visit the website at gloryboats.com or call 501-216-2628.